POSTCARD DESIGN SPECIFIC TO KIRKCALDY4ALL. THIS WILL BE ONE OF A SERIES OF POSTCARDS WHICH WILL BE DEVELOPED FOR DIFFERENT STAKEHOLDER GROUPS AND FOR DIFFERENT URBAN SITE LOCATIONS, THAT HAVE BEEN IDENTIFIED AS SPACES FOR REGENERATION OR RENEWAL. 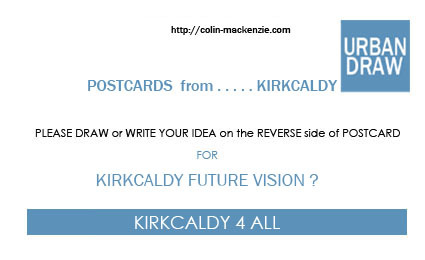 THIS CARD ASKS THE BOARD MEMBERS OF KIRKCALDY4ALL WHAT THEIR INDIVIDUAL FUTURE VISIONS FOR KIRKCALDY WOULD BE. IT IS HOPED THAT A DESIGN WORKSHOP WITH THIS PARTICULAR STAKEHOLDER GROUP WILL UNCOVER NEW IDEAS, WHICH WILL BE ILLUSTRATED FOR THE MDES PROJECT. I had a quick meeting with Kirkcaldy4All at their offices on Kirkcaldy High Street. I met with with Bill Harvey, who has been very supportive of my design thinking for the MDes Research project. Currently there is a wall display in the Kirkcaldy4All of some of the visual drawings which are the initial propositions based on my design thinking. The meeting involved some further feedback from Mr Harvey regarding the wall display of my work and he confirmed that a great deal of discussion had taken place between K4A board members and other contacts that are involved in the town centre development in Kirkcaldy. One of the key elements that was discussed was the possibility for me to develop the design ideas, in the form of a more detailed illustration, for the promenade idea to create a walking / running / fitness route including design of 100 metre markers, to enable people to calculate how far or how fast they can travel along the promenade. This a very positive development for my design research project. I presented a new postcard, which was drawn on Tuesday 20 March, which shows an idea proposition for an elevated boardwalk on the promenade, inspired by the HIGH-LINE RAIL WALKWAY in New York. This idea would need to coordinate with the current plan to redevelop the seawall on the esplanade, using ROCK ARMOUR techniques, which is due to start over the next 2 years. This rock armour installation will involve placing large rocks against the wall as a bastion form to break up the high tide wave formations, which have occasionally led to flooding of the esplanade roadway and buildings located on the edge of the esplanade. 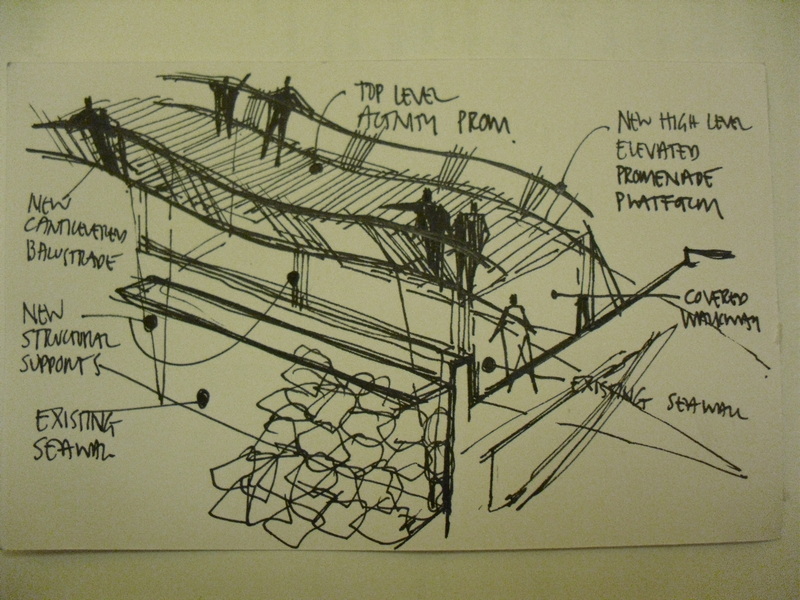 Here is the sketch drawing that was presented at today’s meeting. DRAWN ON TUESDAY 20 MARCH 2012. LINE DRAWING ON A POSTCARD BLANK. THE IDEA IS TO CONSTRUCT A HIGH LEVEL PROMENADE WALKWAY OR BOARDWALK, WHICH COULD BECOME A REALLY INTERESTING ARCHITECTURAL LANDFORM, UNIQUE TO KIRKCALDY. BY ELEVATING A NEW BOARDWALK, THIS WOULD PROVIDE A BETTER PROTECTION FORM THE HIGH TIDE WAVES and ALONG WITH THE PROPOSED ROCK ARMOUR INSTALLATION, COULD MAKE A FANTASTIC VISITOR EXPERIENCE ENABLING USERS TO HAVE GREAT VISTAS OF THE RIVER FORTH AND KIRKCALDY SANDS, BUT ALSO LET PEOPLE SEE THE KIRKCALDY TOWNSCAPE IN A NEW LIGHT. THE ELEVATED BOARDWALK COULD INCORPORATE A GENTLE UNDULATING FORM TO ADD MORE INTEREST AND A MORE INTERESTING DESIGN SOLUTION. This drawing will be the inspiration for a more detailed illustration along with relevant and referenced comparisons to reinforce the design development thinking. CYCLE HIRE PROPOSALS with reference to Dumfries and Galloway initiatives along the River Nith. 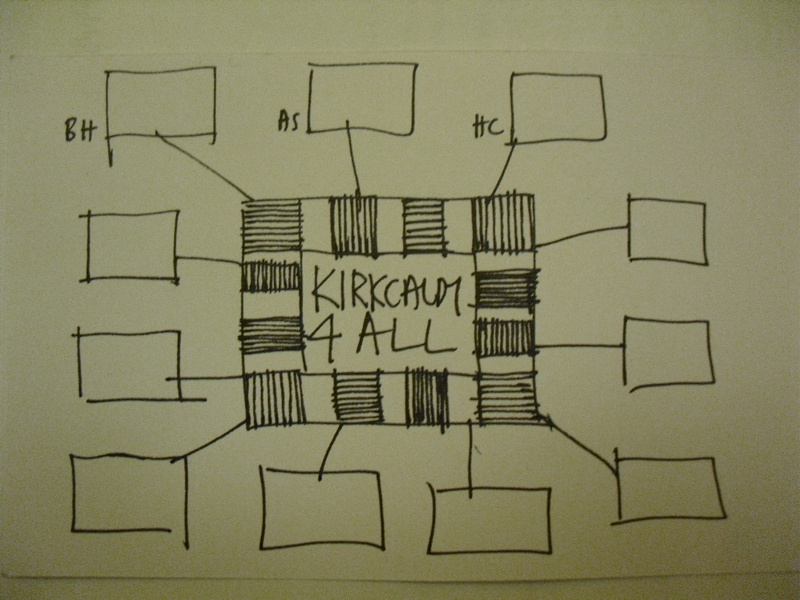 SKETCH DIAGRAM IDENTIFYING KIRKCALDY4ALL AS A STAKEHOLDER GROUP AND WOULD BE THE BASIS FOR A DESIGN DISCUSSION WORKSHOP TO GET THE BOARD MEMBERS TO PARTICIPATE AND FILL IN THE BLANKS WITH THEIR INDIVIDUAL and COLLECTIVE THINKING.